Silver Surfers -- the Baby-Boom Generation -- are Logging on More Frequently and With More Savviness Than Their Kids; Will Online Content Shift Fast Enough to Meet Their Needs? PASADENA, CA--(Marketwire - April 24, 2008) - Despite the young age of the internet, the age of its users is increasing. Ofcom (Office of Communications), a UK regulatory agency, reports, "Silver surfers account for nearly 30 percent of total time spent on the internet, yet the 50-and-up crowd, with particular needs and interests, are being overlooked for a younger market." Health is a large concern as this generation is discovering their nutritional needs have changed from what they were twenty years earlier. Few resources meet these needs. One online publisher to step up and fill this gap is Meritus Media, with the launch of Feel Good for Life™, a website for over-50s with information about alternative medicine, vitamins and supplements specific to that group. Boomer-specific information on vitamins, minerals, organic foods, and natural solutions is grossly underrepresented in the online forum. Most health websites don't offer content specifically for silver surfers, and fewer still have complete information on natural health. Internet innovation for the silver surfer has begun; Jeff Taylor, Monster.com founder, has created a social networking site called 'Eons,' specifically designed for the older internet user. Although not as sophisticated as some of the other existing social networks, it's definitely a step in the right direction. Feelgoodforlife.com is part of this innovation. The site's senior editor explains, "This website was created specifically for boomers. We are giving them information about healthy living -- lifestyle choices, good nutrition, appropriate exercise and alternative medicine options. Our aim is to help our readers live up to the site's name -- to feel good for life." And Feelgoodforlife.com meets that objective. It is concise, audience-specific, and thorough in its content. 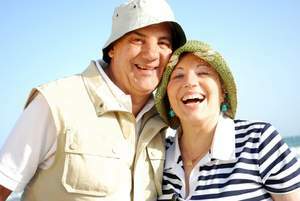 Subjects covered are women's health, men's health, nutrition, anti-aging, heart health, vitamins and natural solutions -- all with a focus on the mature user. As these sites gain in popularity, more will become available, finally meeting the internet needs of the silver surfer.